A delightful audience friendly SATB Saxophone quartet, lyrical and around grade 6 standard. Complete with full performance CD and minus one tracks. 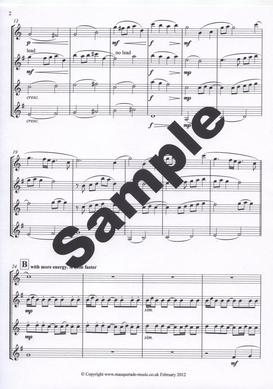 Click on the sample images above to access full sized and printable sample pages. 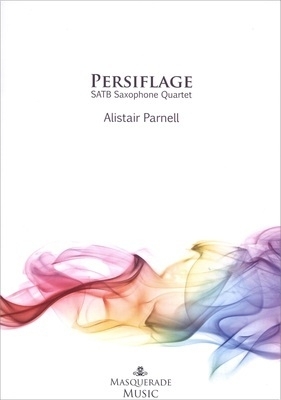 Available from 5th April 2012; Pesiflage or light banter was commissioned in early 2012 by the Nottingham based saxophone quartet of the same name in celebration of their 10th anniversary. With a duration of 4'40 minutes it is an excellent addition to any quartet collection in addition to being simply 'audience friendly' and listenable in general. Scored for SATB saxophones, the piece eases in with a lyrical memorable theme before graduating to a more forward moving inner section, all the time weaving in those seperate 'voices' very effectively. The piece carries a building 'celebratory' feel in response to the original subject matter and finally returns to the original theme in conclusion. Persiflage is considered intermediate standard. A graduate of the Royal College of Music, Alistair Parnell is based in Nottingham, UK. His busy schedule includes teaching, performing, composing, arranging and conducting.His very successful private teaching studio has been established for more than 25 years and he is Visiting Scholar of Saxophone at the University of Nottingham. As a performer, Alistair works with some of the country’s leading saxophone ensembles, including the Flotilla Ensemble, the Northern Saxophone Quartet and the Tribune Saxophone Octet, and he is director of the innovative Equinox Saxophone Ensemble. 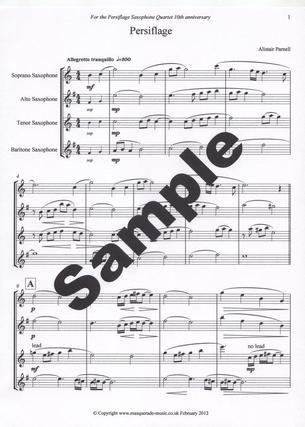 Persiflage SATB quartet is also available to order as PDF / MP3 emailable option (simply select this option from the drop down box on ordering); great for overseas customers or those just liking a bargain!